Happy New Year everyone! We’re starting the year with a bang and a fight! 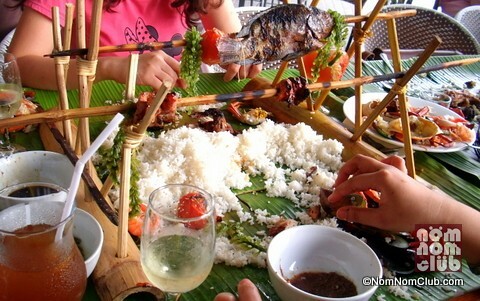 A Boodle fight that is! Honestly, the idea of a Boodle Feast was foreign to me. 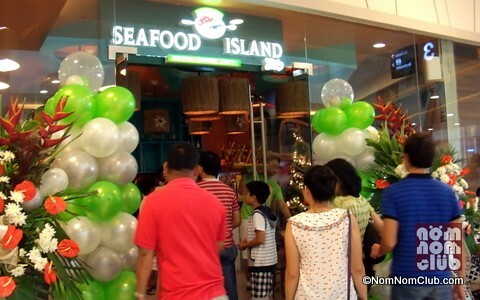 So when Blackbeard’s Seafood Island invited NomNom Club for their Robinsons Magnolia Mall opening launch weeks ago, the curious cat in me immediately said ‘yes‘. On it’s 8th year in the restaurant industry, Blackbeard’s Seafood Island (BSI) is staying true and strong to what they are known for – the Boodle Feast. 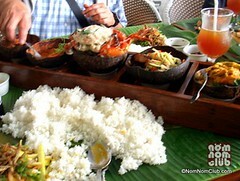 It was a first for me to try on a Boodle Feast. It is characterized by eating directly from one big banana leaf with boodle trays where the food is served with minimal utensils because you are expected to eat with your bare hands. 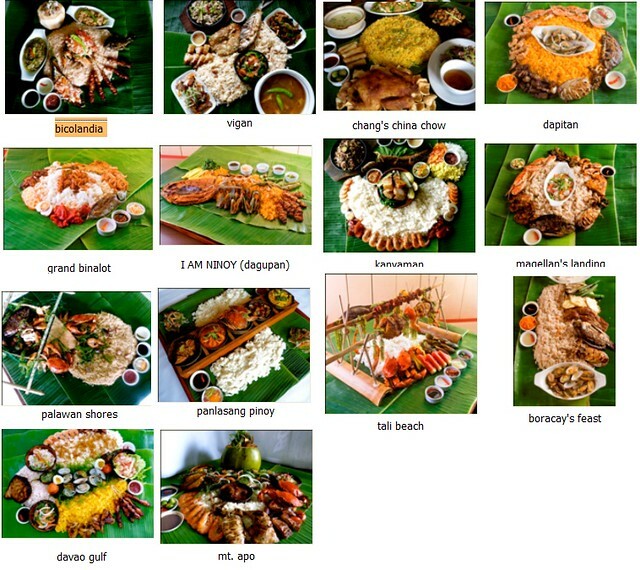 Although I was a bit late for the gathering, I took on the Boodle food gracefully and ate slowly while trying on the different kinds of seafood in the Boodle set. Although I have yet to be acquainted more with the practice, the food was satisfactory. Magellan’s Landing (P965/P1250) – with danggit chips, kinilaw na tanigue, grilled tilapia, grilled squid, grilled shrimp, steamed crabs, chicken inasal, grilled talong and bagoong rice. Panlasang Pinoy (P875/P1365) – Hipon sa aligue, Sinuglaw, Ginataang Alimango, Adobong Manok, Kare-kareng gulay, ensalatang lato with crispy dilis and plain rice. Fiesta Bicolandia (P765/P1150) – Halaan sa buco, pork BBQ, Ensaladang talong, Bicol express, Ginataang Alimango, Laing, Grilled Tilapia with Bagoong Rice. 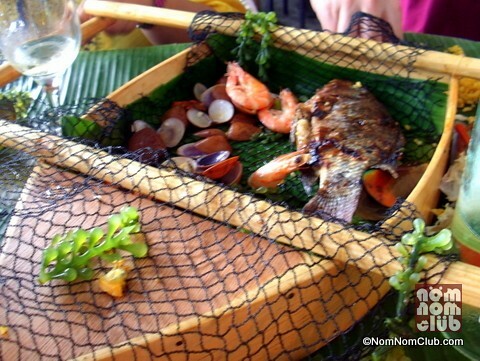 Tali Beach (P965/P1299) – grilled chicken, inasal, BBQ, steamed white shrimps, grilled tilapia, grilled tahong, crabs, grilled squid, grilled tomatoes, lato, mangoes, watermelon with steamed rice. Palawan Shores (P785/P1150) – grilled shrimps, tahong, halaan, squid, tilapia, steamed crabs, grilled corn, lato, sauteed Kangkong sa bagoong with clams and rice. 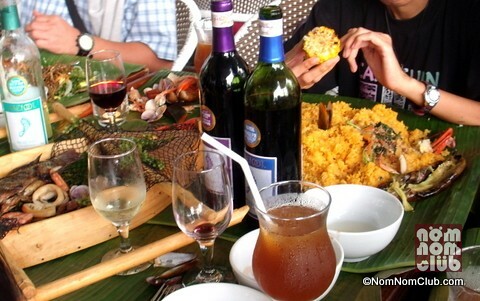 Other boodle feasts are Dagupan’s Pride, Dapitan’s Pride (I am Ninoy), Boracay’s Feast, Mt. Apo, Davao Gulf, Chang’s China Chow, Vigan, Kanyaman, Shabu Shabu (Grand Binalot) and Luau. If you haven’t tried a Boodle Feast yet, try one soon at Blackbeard’s Seafood Island and eat to your heart’s content without the fuss of your usual dining wares and utensils. 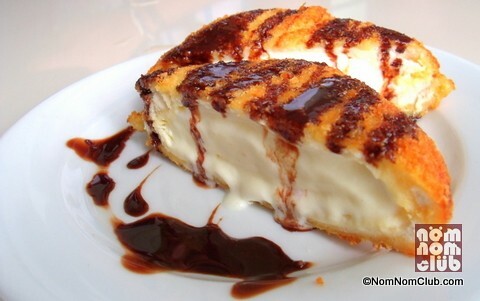 And of course, it is best consumed with your whole family or group of friends.